I loved The Giver and this book reminded me of that story in many ways. The way the Society controls all the information, the Big Brother aspect, and the way fear is used to motivate obedience are all familiar hallmarks of a dystopian book and Ms. Condie builds her world seamlessly on this foundation. While the worldbuilding is all-encompassing and hits all the right notes, the true magic of this story lies in the characters. We feel immediately connected to them, and I appreciated that Cassia begins the story accepting everything the Society tells her and feeling excited about the choices the Society is making for her. When a seemingly small mistake by the Society presents Cassia with an alternate destiny she'd never considered, we slowly inch along that path with her, one tiny decision at a time, until near the end, we're running headlong toward disaster with her and we, like her, can't imagine living any other way. It's a brilliant character arc. I also really loved that both love interests, Xander and Ky, are really likable. There's no clear winner, really, and that makes it poignant and realistic and so compelling. One of the things that I think sets this book apart from other dystopians is the use of poetry, mostly by Dylan Thomas, to inspire the characters. The author expertly uses the poems to breathe life into the characters, to challenge their acceptance of their world, and to make it heartbreakingly clear that the cost of allowing the government to safely make every choice for you is a huge piece of your soul. I have to also give props to the writing style. Ms. Condie has a fluid, lovely style that never gets in the way of telling the story. I was hooked from the first word. I *felt* the poetry, *saw* the drawings Ky makes to explain his feelings, and was just captivated throughout. I can't wait to read the sequel. I heard so many great things about this novel, but was hesitant that it would be too similar to all the other Dystopian novels I have read. What I love about this particular novel is how instantly I felt connected to the characters from Cassia and Ky to the parents and other adults in the novel. Matched romantic elements do not seem forced or overly dramatic. In some instances it is a simplistic telling with hints of Romeo and Juliet while adding its own dystopian twists. The novel also allows its characters to have doubts about the society. Not only do characters question if their government but they deal with understanding the consequences of going against the government. Even though they may know the government is controlling too much of their world, are they will to sacrifice their current world for one with hardships, disease, and unpredictability. Compared to other Dystopian novels this book is fair but highly enjoyable for a lighter read.I am looking forward to reading the sequel, Crossed, which was recently released. 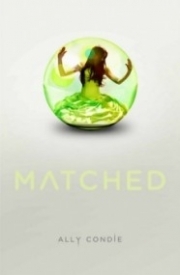 Fans of the Dystopian genre should read Matched. When I picked up Matched, I was so excited to finally get to read it. I was hoping that I would love it and wasn't so excited that I would set myself up for disappointment. Turns out, I loved it! I found myself drawn into Cassia's world, and I what I loved about this story is that it revolved around Cassia's inner journey to make her own decisions and not just a bunch of terrifying, Society events. It's not often that I get outwardly emotional while reading a book but found myself getting a little misty eyed during the scenes with Cassia and her grandfather. The sequel, Crossed, just recently was released and I'm looking forward to seeing how this trilogy continues. If you're a fan of the dystopian genre, and haven't read this, I encourage you to pick it up. It doesn't move quite as fast as other books in this genre might, and it isn't an "action" type of story either. What I mean is, don't pick this book up thinking it's going to be just like the Hunger Games, because it isn't. I think this trilogy has it's own solid place in the dystopian genre. The Society has been all Cassia knows, but when during her Matching Ceremony Xander's face appears, followed by a quick flash of Ky's face before fading to black, Cassia begins to have some questions. She is told it's an error and her life is meant to be spent with Xander, but Cassia can't get Ky out of her head. As Ky and Cassia begin to fall in love, Cassia begins to question the Society, embarking down the path that is away from everything she has ever known and no one ever dares to follow. I've heard so many wonderful things about this book. I've heard nothing but glowing things about it. I really liked it, but for me it just didn't have a wow factor to push it to the next level. There were so many wonderful things about it, but it just didn't have that addictive quality I crave for in a book. The characters were my favorite part of this book. I really liked Ky, he was so sweet. Cassia was a strong character as well. Even the smaller characters really just came to life and brought so much to the story. Cassia's Grandpa was another character I simply loved - he was such a nice person. I loved the society aspect of Matched. The world was just so neat. I really liked all the little details Condie put in. The plot was intriguing, but, for me, was the biggest fault of the book. It just lacked that umph that makes me crazy addicted to a book. I still was interested while I read, but there was never that need to know what is happening next. It was simply good. The story was a bit slow moving for my liking. Condie did a wonderful job developing the world, but that took a lot of time. The ending was one of the best parts of the book, and has me very excited for the next book. I think the sequel(s) to this book will be even better than this one, as the world is already built and it doesn't need to be developed. I did like this one, and I would suggest reading it. It wouldn't make my favorite list, but is definately worth your time to read. This is going to be a short review as I don't really have too much to say. I hated this book, I fell asleep trying to read it twice and even then found myself cleaning the house instead of picking up this book. I finally just made myself finish, hoping it got better... nope. Still, boring and very slow. I will not be continuing this series nor will I ever read something by Ally again, I don't like her writing style either. In Cassia's world, who you marry is determined by who the Society matches you with. When Cassia is matched with her best friend, Xander, she's ecstatic. But her excitement fades quickly when she begins to suspect that something is going on, that there might be an error in the system, and that Ky, another boy her age, might have been meant to be her match. As she starts to question the Society, she finds herself torn between Ky and Xander, between obedience and rebellion. Breaking more and more rules, Cassia must make a choice. Will she live the life that the Society has planned for her? Or will she break free and look for something more? This is the kind of dystopian or futuristic novel that I like to read. It's got an oppressive or controlling government, a forbidden romance and lots and lots of rebellion. I think that my favourite part about this whole book was how Cassia started to break rules and defy the Society, because the tension and worry I felt that she might get caught was super intense. The author completely immersed me in Cassia's world, and I dreaded her having to face the consequences of her actions. At the same time, I really hated the government and the Society and I couldn't stop reading because I just had to know if she would rise above them, and succeed in her goals. When I say that I was reading this book at every chance I got, I mean it! The romance was a little bit cheesy but I actually don't mind some cheesiness within my reads, so this didn't bother me at all. It was a forbidden romance too, which added to the whole rebellion aspect. As somebody who appreciates love triangles, I can say that I think the author wrote the love triangle in this novel extremely well, and I am still undecided concerning who I want Cassia to end up with. I find that those are the best kind of love triangles because they make me frustrated, and wanting to read the next book in the series to see who the character chooses! I was sad as I neared the end of the book because I wanted more. I wanted to keep reading about Cassia's situation and story, I wanted to know what would happen next. Flipping the last page left me super disappointed because I enjoyed this book so much! I can't wait to get my hands on the next one, and I hope it's just as amazing as the first book in this series. I recommend this book to those who like their dystopian reads with some romance! If you also like reading about people starting to rebel against their situation, this would be a perfect read for you. Good book. This novel succeeded in spades in all the ways that ACROSS THE UNIVERSE crashed and burned (I compare the two only b/c I read them so close together, and I was harsh with ATU for its failure to properly place the characters in the context of their frame of reference). The protagonist of MATCHED, Cassia, took the full length of the novel to slowly awaken to the horrors of her twisted, dystopic reality. The voice was engaging and I sympathized well with the characters. The world was intentionally drab, simple, and boring, yet Condie managed to maintain my interest throughout. I enjoyed her vision of a future that is dictated largely by a nearly-religious reliance on probability and percentages to effect outcomes and therefor exact control. I think that the profession of her matchers and "sorters" won't seem so strange to readers of this novel a hundred years from now; we're ineluctably heading in that direction. Condie's writing is superb. Her patience with plotting and with Cassia's slow development as a would-be rebel are rewarded with a story that feels utterly plausible. The creepier aspects of her dystopia are genuinely creepy (everyone is mandated to carry a set of three pills, one for anxiety relief and one for which no one knows the actual purpose; mandatory euthanasia at the age of 80; etc...). There are several nice allusions to the best of dystopic literature and film, titles too obvious to bother naming. I think this novel aspires to be a celebrated master of its genre. Ultimately, it doesn't reach that pinnacle for me. I'm afraid the YA focus on the main character's romantic entanglements hold the story back. This is a criticism I often have with YA novels, so dismiss it if you like. Regardless, the novel embraces an overly-simplistic larger world structure in which this control through mastery of probabilities is too tidy within the story to be taken too seriously. Granted, Cassia's awakening isn't "tidy," and the hint of unrest in the outer provinces is welcome, but still, the control aspect is too one-dimensional for this novel to achieve the high status it aims for. Anyway, I'll probably keep reading the series (you almost have to--the story doesn't "end." We're left with too many questions about characters we've grown to care about. This is another gripe I have...a first novel, even in a series, should be able to stand alone. I don't like to feel that my continued readership is assumed.) If you're interested in how to write a story in which a character slowly awakens to surroundings that they've otherwise taken for granted their whole life, this is a good study. I would recommend it to any reader. I liked the concept. It was great take on the "Dystopian" era. Think Delirium meets The Selection meets bits and pieces of Hunger Games and Divergent. To be honest, while reading Matched, I felt I was reading all the other dystopian novels I had read rolled up in one. The matching reminded me of Delirium. The banquet reminded me of The Selection. The pills reminded me of The Program. And a lot of other things reminded of a lot of other YA books. BUT I enjoyed it. It was an engaging read, good enough to while away a lazy Friday. Cassia lives in a world where people are ‘matched’ with a suitable person when they turn a specific age. She is matched with her best fiend Xander, but there is a slight glitch. When she takes a look at the microcard that holds her ‘matchee’s’ data, she sees someone else’s face. Ky’s. It’s the ultimate love triangle but where Condie has failed is in the development of the characters. I never felt much for either of the guys. Cassia on the other hand was entirely relate-able. I couldn’t help thinking how a matching is so much like an arranged marriage (very common here in Pakistan). The excitement, the nervousness, the joy at finally having been matched would be something a lot of girls can relate to. Would you want to be matched? Have you ever wondered what would happen if all the decisions in your life were already made? That's what Cassia, a 17 year old girl living in the Society has to deal with. The society choses everything. What your job is, where you live, when you die. Specifically of these things, who you're matched with. At 17, each person will be matched with someone to marry and live a life with. When Cassia is matched with her childhood best friend Xander, she is sure he is the right one. One day, when she is checking out his micro card, another face appears on screen. One she knows. Ky, another friend of her's. But, Ky is an exception. He can never be matched because of his past. After Cassia sees him on screen, she starts to question who her real match is. Will Cassia take the choice society picked or try a different path? Find out in matched. I really loved this book. The story line was great, exciting, and made me want to keep reading. The romance aspect made it interesting, yet there wasn't too much of it to be annoying. I recommend it for anyone. Matched took a very long time to start but once the story really got going, I didn't want to put the book down. The Society controls everything. From what they eat, wear, and what leisure activities they are allowed to pick from to who and when they marry, when and how they die, and how they live. The list goes on and on. And somehow the Society has managed to brainwash everyone into thinking that this is all for their own good. It's disgusting and frustrated me throughout the entire book. If I had to compare it to any fictional world, it would probably be to what it must have been like to live in the Capitol in The Hunger Games. For the first one-hundred pages or so, the narrative was at times disjointed and hard to follow, but thankfully that changed. Honestly, I mostly kept reading because I was waiting for the book to get better. I had heard it was great so I was expecting to devour it in two days or less. My mistake. The first half wasn't awful but it felt like nothing was really happening. But... once we got to around page two-hundred, things started to get better until finally, I really didn't want to put the book down. The second half is what I expected most of the book to be like: gripping. Cassia pretty much annoyed and frustrated me for the first half of the book. But that's mostly because she could only think about the same three things over and over again. Thank goodness for chapter twenty-one! Finally, Cassia admits to herself who she actually loves and the love story really starts to move along. Xander pleasantly surprised me. In the beginning it seemed like he would be the type of friend who the girl only likes because he's all she's ever known. And those type of guys tend to be really annoying. A good example of what I mean by this is Jason from The Hourglass Door. He was the guy the girl always want but turned out to be a dud. Thankfully, Xander wasn't like that. I actually really like him but not as Cassia's Match. I'm not quite sure what I like about Ky. He's not like the typical love interest you usually find in these type of stories. You don't know about his past, but he's not mysterious like Four from Divergent or Wolf from Scarlet. He doesn't have that safe but dark feel to him, which was unexpected. Nevertheless, I really do like Ky. He's a real person in a story full of brainwashed characters. Even with all of my complaints, I do want to find out what happens to Cassia, Ky and Xander, so I will be reading the second book. Thank goodness the second half redeemed itself, but I was very disappointed that it took so long for the story to get moving. Despite my complaints, I'm glad I read Matched and will be reading the rest of the series. For Cassia, Condie’s main character, everything is electronically tracked, from how well you perform academically to what sort of things you like to do in your free time. With all of this information, computers do a little beep-boo-beep, and voila! They discover your perfect match. Unfortunately for Cassia, the system has found her two perfect matches. The problem? Besides not allowing polygamy as an option, the government has also chosen the match Cassia is required to eventually Contract with (marry), and she thinks she is falling more in love with the other guy. “Matched” explores that lovestruck concept of whether or not there can ever be the perfect person for you on paper (or on a computer screen), or if true love comes from random, unpredictable moments. To give it a little pizzazz, the concept is paired with a futuristic Giver-like dystopia where everything seems picture perfect on the surface, but might be a lot more ugly as you dig deeper. If it turns out computers actually can find that perfect partner, that’s one app Apple really needs to capitalize on. New take on dystopian novels. Interesting ideas on the existence of soul mates. In Society, where everything is darn near perfect, mistakes rarely happen. So when Cassia is matched with one of her best friends, she is over joyed. Everything is going perfect until she views her matchs file only to have another boys face appear. Another boy that she knows. Told that its an error and that Ky can't be her match, Cassia starts to realize that the Society isn't perfect. People are told what to believe and do and they do it without question. When it comes to love, should other people get to decide for you? Matched was an interesting take on a realistic future. I did not expect to like this book as much as I did. Usually I don't really go for the lovey-dovey centered stories, but this book made me realize that I do appreciate a well-written romance, which is what this book incorporated really well. Like I said, this book very well-written. I loved how the author revealed this utopian Society to us. It was really interesting to read how his world works and all the conspiracies that were actually going on beneath the surface. Plus, this book brought up some moral issues like free will vs. the good of people that got me thinking. I mean, who doesn't like some philosophy with their YA book of their choice? As far as world-building goes, Ally Condie did an excellent job. Onto the romance. I liked how the author worked the romance into the story; it was kind of like a tool used to help Cassia discover what was wrong in the Society, which I guess it was. Love triangles are so overdone in the YA genre, but I didn't mind this one. Cassia was a good, strong main character; I really liked Xander, even though it was clear he would get the short end of the deal; I just wished we got to see Ky and Cassia's relationship develop more: it seemed rushed at some times throughout the book. Still, a very clever romance aspect. Overall An awesome new world that I can't wait to get back to. So what if romance plays a big part? Read it!